As we get further into the winter months, the mortgage industry prepares for a hibernation of sorts. This time of year typically yields the fewest mortgage quote and lock volume before picking back up again in the spring and into the summer. A major factor to this is likely because of all the holidays that are jam-packed into this time of year. We’ve previously examined data on mortgage quote seasonality from month to month (which showed a substantially lower mortgage quote volumes from November to February), however we wanted to further examine the holiday season by pulling Marksman data* surrounding the three major holidays of the season; Thanksgiving, Christmas, and New Year’s Day. 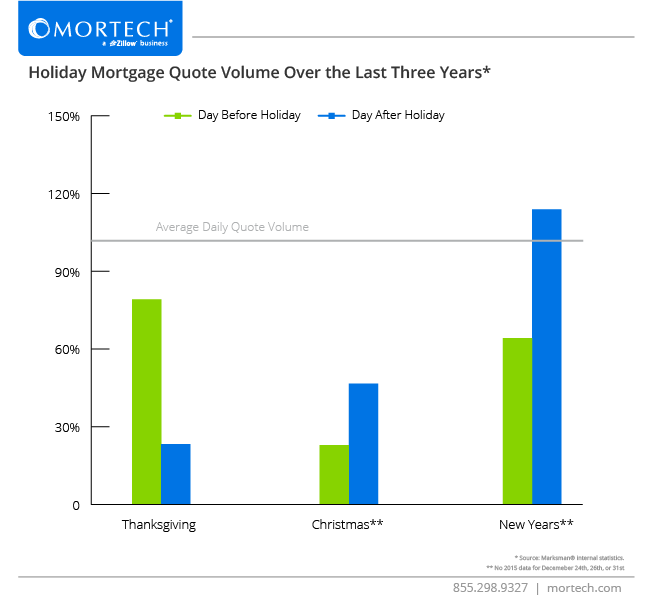 Thanksgiving’s mortgage quote volume is quite consistent year over year, and part of this is likely due to the timing it has compared to the other holidays. Whereas Christmas and New Year’s Day are on different days each year, Thanksgiving always falls on a Thursday, with most people typically having the following Friday off of work as well. So it makes sense that the day before Thanksgiving, which is always a Wednesday and typically not observed as part of the holiday, has quote volumes very near the daily average. These volumes then taper off by Black Friday. Christmas’s seasonality data also follows a fairly predictable trend, but the day after the holiday does show a little bit more variance than we saw with Thanksgiving’s data. Naturally with the day before being Christmas Eve, mortgage quote volumes are quite low, even if still sitting just below 30% of the daily average. However, the variance that lies in the data of the day after can likely have the same reason as Thanksgiving’s consistency being applied to it. Because the day after Christmas in 2014 was a Friday, most people likely extended their Christmas holiday the extra day and into the weekend, which significantly lowers the chances that they would be quoting loans. However, with 2013’s day after being on a Thursday, that scenario is substantially less likely, and more quote volume is likely responsible for the day after Christmas being higher than the day after Thanksgiving. New Year’s Day has substantially more activity surrounding it than the other holidays, seeing higher volume than the daily average for the day after. New Year’s Eve is much higher than Christmas Eve’s volume across the board, however it still sits between 60% - 80% of the average daily volume. However, the day after the holiday sits at 116% of average daily quote volume, much higher than any other day in this data set. In the last three years, rates have been at record lows entering into the new year, which would explain the huge volumes at the beginning of the month, given the relationship we’ve seen between data and quote volume in several other instances. The low rates would bring in an influx of refinances, which coupled with standard quotes for loans, would explain the high numbers. Regardless of the time of year, rates always need to be accurate and reach the widest audience possible. Talk with us today about how Marksman can achieve both for you and your business, as well as provide several different secondary desk tools and prospect management solutions that ultimately help you close more loans.